Shirin Nariman, a human rights activist, a former political prisoner, and one of the the campaigners collaborating with Mission Free Iran in this case has called for global protest in support of Jafar Kazemi and all of those under imminent threat of torture and execution. Mission Free Iran supports that call by opening this campaign. Glasgow SCOTLAND: 2pm on Buchanan Street at the junction with Gordon Street, outside Borders Books (which is now closed but everyone knows it). Email maria.rohaly@gmail.com if you want to hold a demonstration in your city or town. We put together a document on how to hold your own protest for Sakineh Ashtiani; it can also be used for this protest too. 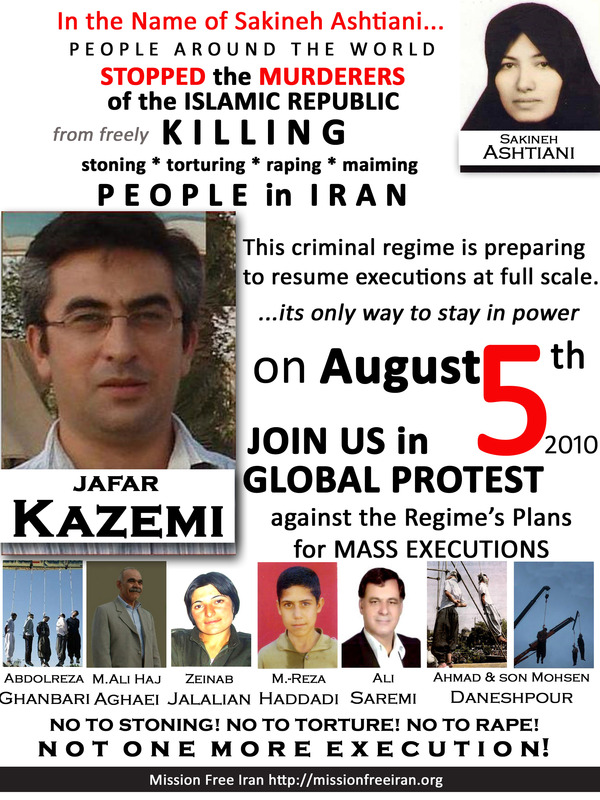 If you can’t join us in person on August 5, make a 30-second video in support of Jafar Kazemi and those at risk of execution in Iran and send it to editor@persian2english.com. « July 31, 2010: Letter from Mohammad Mostafaei – If You Believe in God and the Judgment Day, Release My Wife and Her Brother. I really think you should be watching the freedom of your own country for now and stop worring about others. There are many more people and children dying from starvation and disease. David, what is our ‘own’ country, since this blog is written by an international team and read by an international audience? This is not a case of ‘us’ and ‘them’. We are all human beings and all have equal right, ability and responsibility to shout when others are being silenced and mistreated. I find your post distasteful and misplaced. No one is stopping you helping these starving people in your own country, whatever one that may be. GLOBAL PROTEST FOR HUMAN RIGHTS IN IRAN.I SUPPORT YOU! I feel that we should support all, but mainly this one, becuase this has been going on for too long. Their abusing women, and just basic rights of human LAW. A life to a person in Iran is lead by fear, and pleasing those who want you for an object. They insult one gender, one specific gender… and abuse all humans who are not in “their” religion. This is a pressing need and we should get behind it with all our efforts and resources. News from inside indicates that the leadership is aiming for more executions. Please support this campaign. From bottom of my heart, I am opposed to all primitive acts and atrocities such as stoning, killings, and tortures. No one should be prosecuted and imprisoned outside of full boundaries of civic laws, presentation by professional attorneys, and fair, open and lawful trials. I pray for establishment of a fair and just democratic government in Iran. Glogal protest for human rigtrs in Iran Matar pessoas por apedrejamento é desumano ,cruel e injusto . JESUS que é considerado um profeta no ALCORÃO disse : atire a primeira pedra aquele que nunca pecou .
. Free Iran . Save your people . Please , SAVE SANET MOHAMMADI ASHTIANI . SAVE SAKINET MOHAMMADI ASHTIANI . PLEASE .